My sister is so inspiring... once a month on Thinking Outside the Box, she will have a new technique to get yourself motivated to try something new. This week her Think Technique article is about the ever so popular spray paint. I love this layout that she did. 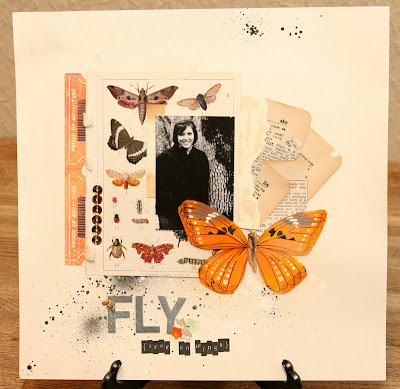 Last week she was over and asked if she could have the below vintage butterfly page. I looked at it and said, "Sure... Hey! Where did you find that?" She laughed, as if to say, "Finders keepers." I guess it was in my vintage dictionary. Read the article for more layout inspiration and close up photos of her layout above. Create Well: Just spray it! I know how lucky... at least I have Jen. I used to work for a scrapbook store and scrap w/ friends all of the time. I also used to meet with a group of ladies once a month for a crop party. Days gone by.